The SN74HC08 (7408) integrated circuit provides four independent two-input AND gates in a single package. The basic example circuit presented here demonstrates the use of the SN74HC08. The basic usage presented here should also be informative in application to other similar quad two-input logic gate ICs in the 74HCxx series such as the SN74HC00 (7400) quad two-input NAND gate IC, the SN74HC02 (7402) quad two-input NOR gate IC, the SN74HC32 (7432) quad two-input OR gate IC, and the SN74HC86 (7486) quad two-input XOR gate IC. To understand the circuit, refer to the pinout diagram of the SN74HC08 datasheet which is copied below for reference. Pin 14, labeled Vcc, is connected to the positive power rail, and pin 7, labeled GND, is connected to the negative power rail. The AND gates on the IC are available in groups of three adjacent pins, as indicated by the standard symbol for the AND gate. For this circuit, pins 1 and 2 are the inputs, and the result is output on pin 3. Inputs can never be left "floating." Here they are connected to ground via 10K "pull-down" resistors. These resistors ensure that the pins will read low when there is no input, and will only register as high when a signal is applied via the DIP switch. 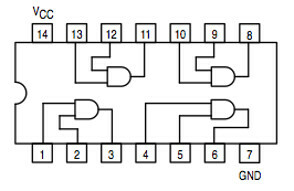 The schematic follows the convention for showing IC logic chips with multiple gates per chip, where individual gates are presented with their standard logic symbol and noted with A, B etc. to designate the different gates on the same chip. In the schematic unused switches on the 8 position DIP switch are not shown. Refer to the board diagram for placement of the DIP switch.